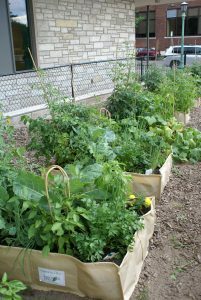 MSHS partners with nonprofit and community organizations; childcare centers; community centers; schools; and in some cases, family homes to distribute Garden-in-a-Box vegetable gardening kits. Partnering organizations can apply for multiple kits (See "How to Apply" page). As a partnering organization, we would provide you with free vegetable garden kits valued at $150, along with timely and pertinent gardening educational materials and support. There is no cost to you. This program is funded through generous foundation grants, support from individual donors and local garden partners. Works with youth and low-income families to help them learn about the benefits of growing vegetables and gain easy/affordable access to healthy foods. Has a high amount of participants actively gardening (planting, maintenance, and harvest). Has multiple staff/volunteers dedicated to assisting Garden-in-a-Box program participants. Can commit to working with the Garden-in-a-Box program (receiving free plants, supplies, and support yearly) for 3 years. The box’s location(s) receive a minimum of 5 to 7 hours of sun daily. The box’s location(s) has access to water. (Overhead (sprinkler) watering is not recommended). Have approval of landlord to place the 3’ x 3’ garden container on the property. Note: the box is NOT suitable for balconies or wooden decks. If necessary, boxes may be placed on slightly uneven or solid surfaces like concrete or gravel. Arrange to pick up all materials from a distribution site and deliver them to the garden location. Fully plant the boxes and confirm names and locations of the planting address within 2 weeks of pick up. Make available instruction and/or classes with no charge to program participants. Respond promptly to requests for communication including: photos, stories and testimonials about your program, and harvest records when requested. Agree to keep all contact information current during this growing season and to be available to assist with site visits. Complete the final evaluation form for the purpose of documenting the program and how its resources were used.